I believe Rohrer and Klingner has been around for well over 100 years. People who have tried their fountain pen inks seem to enjoy them. However, I believe R&K doesn’t receive the attention it deserves. This may be due to a rather limited line as compared with the likes of J Herbin, Noodler’s, etc. 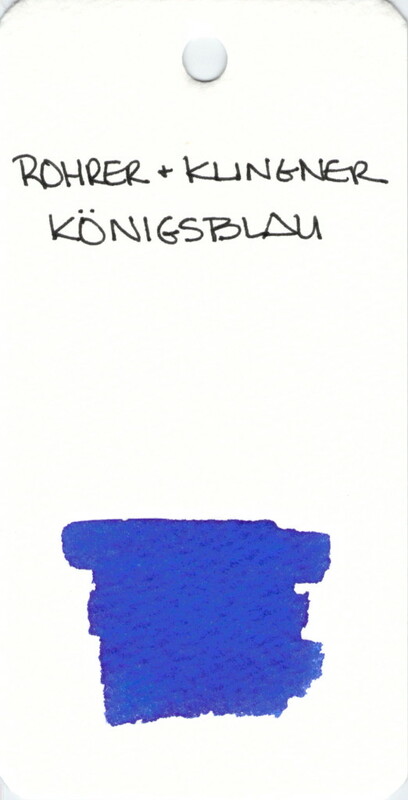 I have yet to try Konigsblau. Have you? Share With Your Friends . . . This entry was posted in INKS and tagged blue, ink swab, rohrer & klingner by Christine (Pentulant). Bookmark the permalink. Find It Here. . .